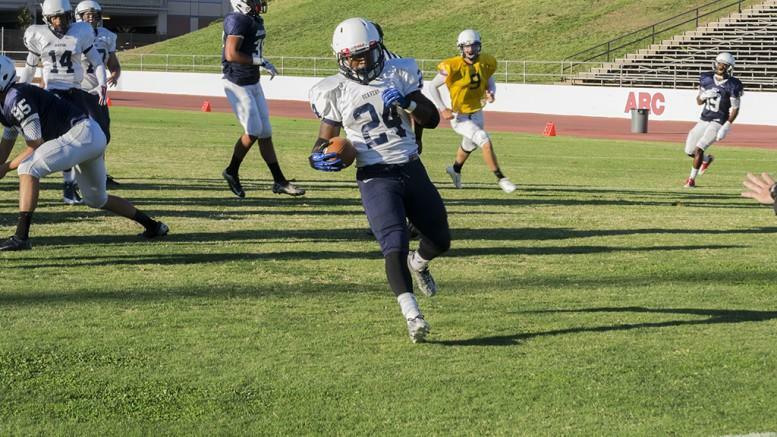 After suffering a crushing defeat to open its season, American River College’s football team will host 0-1 De Anza College, a team that failed to win last season with an 0-10 record. In last week’s loss, ARC’s quarterbacks combined for five turnovers and four interceptions, while the first four drives ended in three and outs. Both coaches and players blamed the offense’s poor performance on a bad week of practice, but this week of practice went better, according to quarterback Chris Guillen. “The week before we weren’t really focused, (this week) we really stepped it up. We know what more to expect. (We) eliminated the mistakes in practice that we did during the game,” he said. Head coach Jon Osterhout said his team hasn’t done anything different in practice than they did during the last five years. “Execution is a commodity. We have to manage the football. We have a high expectation of the way we practice and the way we play,” said Osterhout. Last season, ARC defeated De Anza on the road last September 49-28, a game in which ARC pulled away in the third quarter by scoring 35 points in the second half. In the 2014 season, De Anza allowed 45.4 points and 442 yards per game, while its offense scored just 17.3 points and 247.4 yards per game on offense. “Play our football, play how we play and how we’ve been practicing since February. We’ll be fine,” said Vercher. Of the three quarterbacks that saw significant action for De Anza, none threw for more than 1,000 yards and none finished with a completion percentage greater than 45 percent. In addition, none of De Anza’s players finished with more than 400 yards rushing or 400 yards receiving. In their last meeting, ARC finished with 410 total yards of offense and 147 yards rushing. De Anza finished with just 200 yards on 80 plays, while ARC finished last year’s game with 22 penalties. ARC is currently ranked 15th in the state after its loss, dropping 11 spots from its preseason ranking, while De Anza is not ranked. ARC linebacker Jordan Kunaszyk is ranked first in the state with 10 solo tackles. ARC is playing De Anza Saturday at 6 p.m. in Beaver Stadium. Be the first to comment on "ARC looks to rebound against 0-1 De Anza"